l-r Liam White HSE, Sandra Claxton HSE, Michelle Rooney MIA, Natalya Pestova MIA, Nicci Rowntree MRCC, Jim Power MCCC, Paul Murphy HSE. 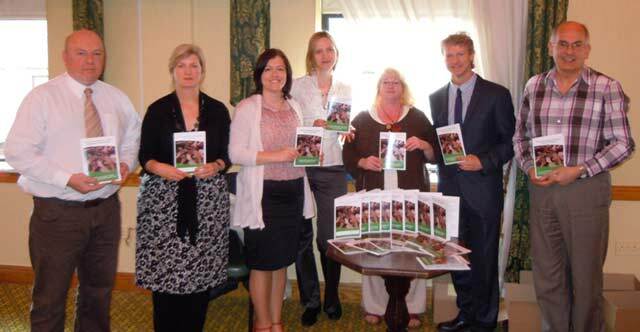 The Mayo Multilingual Support Services Booklet was launched on 19th May in Castlebar by Jim Power of the Mayo County Childcare Committee. The booklet was developed to provide information on support services for children and families that are available in Co. Mayo. The Mayo Multilingual Support Services Booklet is available in eight different languages including English, Irish, French, Russian, Polish, Urdu, Arabic and Karen. The booklet is a useful resource for information and contact details of organisations providing direct support services. Natalya Pestova of Mayo Intercultural Action who spoke at the launch said ‘migrant families who recently moved to Mayo, and indeed migrant families that have been living here for some time, need extra assistance because they do not have a support network of extended family, friends and neighbours. Many migrant families live in isolation and have limited knowledge of support services available to them. This multilingual booklet is a much needed action to create awareness among the group on a range of local community and statutory services'.